This cottage charmer features a solid 1" thick hardwood table top and two sturdy and durable hardwood pedestals. The double pedestals are joined by a solid hardwood stretcher for additional stability. Pedestals feature plain feet, whose gentle curves bring to mind the ocean's waves. 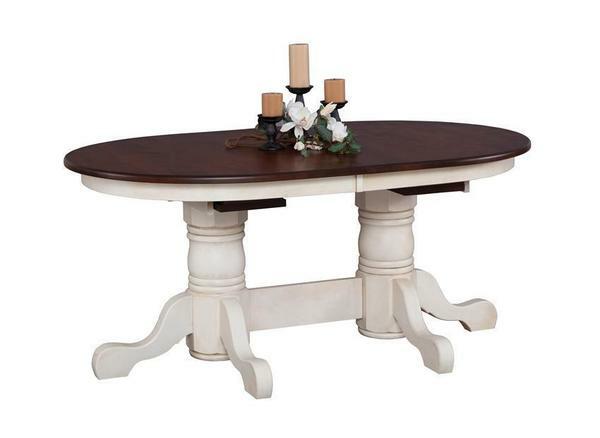 The Nantucket Pedestal Table is perfect for a beach house or cottage. Customize the look of this Amish table by choosing from a variety of solid wood and finish options. As an additional benefit, the Nantucket Dining Table comes standard with two self storing 12" leaves, one with apron, and one without apron! Call DutchCrafters today to speak to an Amish furniture specialist with any questions or to begin an order for your new Amish table. You can reach us at 1-866-272-6773 or by visiting us at our brick and mortar store in Sarasota, Florida. We love our table thank you so much for making this happen! So appreciate all your effort to make it right!